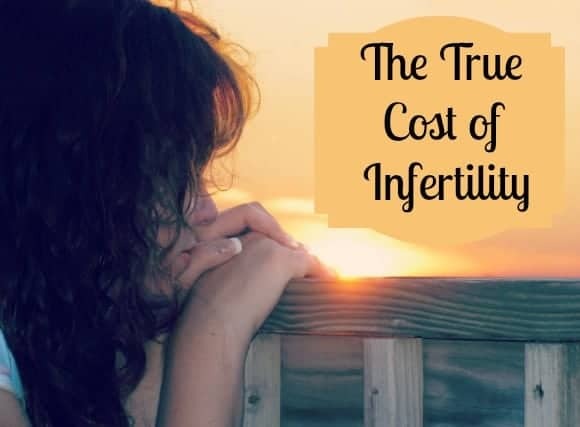 The true cost of infertility is much higher than you may imagine. Forget, for a moment, the costs involved in actual fertility treatments, especially IVF. Those can be astronomical on their own. I’m talking about the true cost- both emotionally and physically- of dealing with long-term infertility. From lost wages due missing work for tests and treatments to therapy bills for treating depression, the true cost of infertility is more than just the amount of money spent on a particular treatment. To understand the true cost of infertility, we need to take a look at just how wide-spread the problem really is. In Canada, approximately 15% of women in Ontario have difficulty conceiving, according to Conceivable Dreams. The national average is between 11% and 15%. This is slightly higher than the US average of about 10.5%. That is millions of women unable to start a family. Typically, doctors do not consider you infertile until you’ve tried unsuccessfully for 12 straight months, unless you have a preexisting medical condition. The statistics increase when you factor in women who spent a reasonable six months trying- the point at which many couples realize that something is preventing them from realizing their dream. Before we start talking dollar signs, I think it’s important to recognize the deep emotional cost of infertility. Know that I speak from experience, as it took me six years to conceive my son. Emotionally, it’s devastating. When you know deep in your heart that you were meant to be a mother, but your body refuses to cooperate, it can send you into a tailspin of despair. Each month brings a new round of devastation. Imagine being forced into the grief cycle every single month of your life. You try and you hope. After waiting what seems like a reasonable amount of time, you pull out that magical stick that can change your world: the pregnancy test. It’s negative, but you think “maybe it’s too early.” You try again the next day, and the next, hoping to see two lines or a plus sign appear. You get out the magnifying glass for a closer look. Maybe it’s a faint line! The line, sadly, never comes, though. At the end of that month, you grieve for what never was. You scream, you cry, you get angry, you accept. Then you start the cycle again. Michelle went through the extensive testing required of potential IVF patients. She was tested to determine if her tubes were blocked. Her husband was also tested and found that while he had good sperm counts, the mortality rate was problematic. After all the proper tests were completed, Michelle began her IVF journey. The first round was not successful. The second round was, but unfortunately, did not carry to term. “At the second ultrasound, when we were supposed to get discharged from the fertility clinic, there was no heartbeat,” Michelle explains. Imagine, for a moment, the pain of finally thinking you’re going to see your dreams come true, only to have them taken from you at the last moment. That is what the true cost of infertility brings emotionally. Michelle is taking a break, but she is going to try one more time. We wish her the very best of luck! While the emotional cost of infertility is heartbreaking, the financial costs can be downright bankrupting. Dealing with all the testing and procedures requires time off from work. Michelle explained to us that she had to use her sick days. After collection, she had to rest for 24 hours. Luckily, Michelle worked from home full time and her boss was really understanding of her situation. Still, time away from the job meant loss of productivity for both Michelle and her boss. Imagine that on a grand scale. Millions of women have difficulty conceiving. Millions of families are losing wages during the time spent undergoing testing and procedures. This means millions of hours of lost productivity. It affects more than just one person; it affects the country as a whole. Then, of course, there are the costs of infertility treatments themselves. IVF is the most expensive treatment, yet it is also one of the most successful. Average costs range from $10,000-$13,000 per treatment cycle. Collecting more than one egg at a time can help lower those costs, but it’s still an expense that many can’t afford without assistance. Publicly funded IVF not only helps those who are desperate to become parents recognize their dreams; it’s a financially sound move for the country as a whole. While calculating the exact cost of a loss of productivity is difficult, as it depends on the person’s role in the company, two lost days per month can cost a company thousands of dollars in revenue each month. Within just six months, it’s feasible to estimate that the losses generated from missed days at work can far outweigh the costs of IVF. Lost wages are a problem for the worker, the company and the country as a whole. The less money a company makes, the more people they have to let go. That means more people living on lower incomes, which in turn can affect the economy of the entire community before branching out to the entire world. Think that’s being a bit dramatic? Look at what happened to the world when the US economy toppled. We haven’t even touched the amount of money that will need to be spent providing therapy for the extreme depression resulting from the emotional fallout of infertility! Publicly funded IVF just makes sense from a financial point of view, yet many areas still don’t realize this. Conceivable Dreams, a patient advocacy group based in Ontario, is trying to get the word out to lawmakers about the benefits of publically funded IVF. Help them in their mission by following them on Twitter and Facebook and sharing their messages. Even if you don’t live in Canada, calling attention to their messages can help benefit everyone. Perhaps if publicly funded IVF become the norm in Canada, other nations will recognize the benefits and follow suit. Disclosure: I am a valued member of the Conceivable Dreams blog team and as such have been compensated. My opinion is my own. Thanks so much for the very informative post. I went through some troubles conceiving my second but I cannot imagine how hard it would be to suffer this pain… both emotionally and financially. Thanks for creating such great awareness. What a fantastic and informative post! I had no clue about the emotional and financial costs of infertility. Best of luck! Financially, I understand it can be fairly brutal. I think the emotional cost is the worst. I remember the pain of five years of infertility and how I defeated and angry I was. Good luck! Defeated is a great way to describe the feeling. Angry for sure, but the feeling of having your own body beat you every month is just wrenching. Thank you so much for sharing about this cause. One of my best friends has been trying to conceive for the last five years now. It’s heart breaking to hear her over the phone (she lives in California) and I can hear in her voice how stressful it is. I’m definitely sharing this post with her because I know that it will help to know that there is something like Conceivable Dreams out there trying to help. Thank you for sharing it with your friend! I know it doesn’t ease the pain, but it does help to know that there are people out there fighting to change things. What a great article to really summarize the “costs” associated with infertility. I am shocked at the high number of women who have trouble conceiving. It’s sad and it’s great that so much focus is being put on the subject. It seems like that number keeps rising too! To make it more difficult, of all those women having difficulty conceiving, about 10% of them can’t find a cause! I was in that situation, where they just couldn’t figure it out. Well said!!! It’s time to rise up and educate everyone. I know how Michelle feels. I am in her place now, but can not afford fertility treatments such as IVF. That’s why it is so important to get the word out there and educate those who do not understand the emotional, physical, and financial aspects of those that struggle on a daily basis with infertility!!! Thank you for this ! I’m so sorry you’re going through this right now. I dealt with infertility for six years, and I know first hand how extremely painful it is. I think it’s so important that people realize it’s not just an issue that affects the one going through it. This is a fantastic post. People don’t realize infertility costs the entire economy. I wish Michelle best of luck and three times is a charm I hope for her. It’s so devastating emotionally already that when you add the financial component it is unimaginable. Thank you! We have our fingers crossed for Michelle too!